A few months after we launched Circle of Moms, I hired my first superstar senior back-end developer. Brian had it all: his coding practices balanced speed and scalability, he’d been around the startup block as a founder and employee, and he had a quiet but kickass work ethic that would set the right tone for the team. Over the years, he’d re-architect our (messy) core technology, build many of the features most responsible for our growth, and patiently mentor younger employees. Hiring Brian may have been the best move I made at Circle of Moms. I spent the next three years trying to find someone else like Brian. It never happened, for a variety of reasons: some people weren’t the right fit for us, some weren’t interested in building a product for moms, others wanted big-company salaries we couldn’t afford. The experience underscored the importance of a strong team on a company’s success. On one hand, we were lucky to have someone like Brian; without him, I’m sure we would have been less successful. On the other hand — speaking as a Stanford Basketball fan spoiled by the dominance of both the Collins twins and the Lopez twins — I wish he’d come with a twin brother. In the current developer-constrained world, hiring becomes a product marketing problem. There’s a limited supply of top people, and the startups that aren’t able to market their “product” (the career opportunities they offer) will have trouble hiring and growing. Many a book and blog post has been written on satisfying customers and raising capital. They’re both important and interesting topics. I’ve written about them in the past and will write more about them in the future. Almost nothing has been written about attracting developers, and I wanted to figure out why it was so difficult for me at Circle of Moms. Over the past few months, AngelList Talent has emerged as a strong marketplace for jobs, attracting both top companies and top developers (as well as non-developers). Notably, the AngelList product doesn’t work like a traditional job site. Potential candidates don’t apply to work at a company, and companies don’t send messages to potential candidates. Instead, candidates see a summary of a company and its positions, and indicate — one-click, HotorNot style — whether they’re interested in the company. Companies do the same, viewing candidates one-by-one, and saying yes or no to each. Matches are then introduced. This approach yields a large, clean data set with explicit information on which company profiles appeal to developers (and vice versa). Some people get off on fancy cars, fancy clothes, or fancy wines; for a data geek like me, it doesn’t get much better than large, clean, explicit indications of individual preference. You’ve probably heard of most of these, but there still are some surprises. Pocket (disclosure: I’m an investor) has done very well as a business, but I still wouldn’t have expected them to be a notch above Path. I wasn’t familiar with Instameet, so seeing them in the top ten was unexpected. Meanwhile, some other more prominent companies — 42Floors, Kaggle, OUYA, Skillshare, wikiHow — find themselves just outside the top ten. At the bottom of the list are five companies I’d never heard of (sorry, I’m not going to tell you who they are). Two have products aimed at improving people’s nightlife experience; one is a management tool for a very specialized audience; one is a mobile company focused on saving memories; one tries to improve experiences with physical devices. Like the top companies, most are in the Bay Area. The difference between top companies and bottom ones is large. When someone expresses a preference between a top-five company and a bottom-five company (which has happened almost 500 times) they favor the more highly ranked company over 95% of the time. Now for the tough part: what separates the top companies from the bottom ones? Several factors don’t make a difference. Having a technical co-founder, which one might think would make a company more attractive to developers, does not affect a company’s desirability. And somewhat surprisingly, the equity stake listed does not have any impact, though my analysis here does not account for company size. 1) Industry. 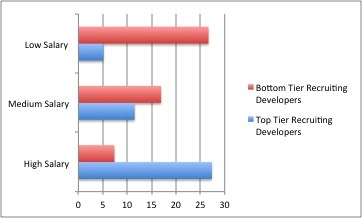 A company’s industry has a large impact on its ability to attract top developers. Nearly 40% of self-identified education startups show up in the top tier of companies most able to recruit, while under 10% of companies in games, entertainment, or advertising are in the top tier. 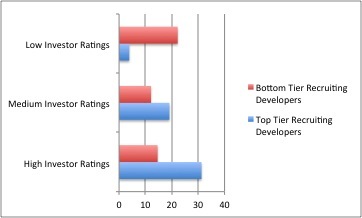 A quarter of games, payments, and entertainment companies find themselves at the back in competing for developers. By comparison, very few companies — under 10% — trying to improve personal finance, human resources/hiring, or personal productivity find themselves in that bucket. Overall, personal finance, HR, personal productivity, and education stand out as the industries most attractive to developers, while entertainment, games, payments, and advertising stand out as the worst. 2) Investor Quality. Top investors certainly aren’t a guarantee of success, but they help a lot. Roughly a third of companies that have the most highly rated investors (based on AngelList’s proprietary models) are among the very best at attracting talent. Interestingly, however, these companies aren’t immune to being among the worst at attracting talent. On the flip side, companies with the least prestigious investors are only slightly more likely to be among the bottom tier at attracting talent, but they are far less likely to find themselves among the top tier of companies like Quora, Pocket, and Path. 3) Founder Quality. Founder quality, using the same AngelList proprietary models as investor quality, can be a very good predictor of recruiting success. Companies with highly rated founders — like Path and Quora, both founded by early Facebook employees — are more likely to be highly attractive to developers than anyone else. However, such companies are relatively rare, as most companies are founded by first-time founders who don’t personally have strong track records. As a result, with founders we see a large “middle”: there are lots of companies started by founders who, on paper, are hard to distinguish as especially good or especially bad. These companies, not surprisingly, are about average at hiring. 4) Salary. High salaries can make a substantial difference in a company’s hiring fortunes. Companies with the most attractive salary offerings — roughly corresponding to a high range of $125,000 — are more than five times as likely to be in the top tier at hiring as companies with the least attractive offerings. 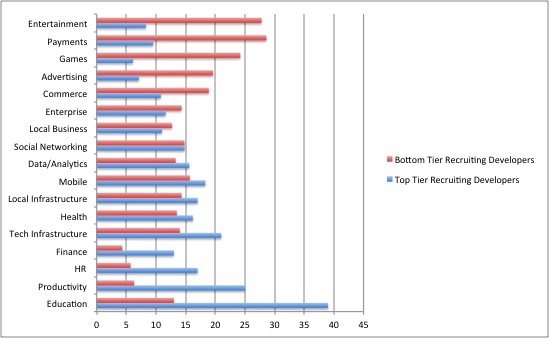 And companies offering high salaries are very unlikely (around 7%) to find themselves in the bottom tier. On the opposite side, we see that it’s very difficult to be great at hiring — at least on AngelList — when salaries are on the low end. These days, good developers have lots of choices. Salary, founder and investor quality, and industry all matter, but they certainly don’t explain away all of the differences in developer interest. Looking only at a statistical model that incorporates those four factors, one would expect that Quora would be the sixth most effective company at attracting developers. In fact, they’re a clear #1, and four of the other five companies the model likes most aren’t in the actual top ten (Clever is the exception). 1) Company Reputation. This is an area where the top companies shine, even beyond the fact that most of them have successful founders and/or investors. Quora doesn’t really need to explain itself, since many top developers are using it all the time. 2) Well-Written Profile. One positive outlier less famous than Quora is LaunchRock, whose tagline is “We *get* users” and whose hiring page starts with “We like to party.” They then confidently describe their business and culture, leaving enough out to keep the reader intrigued. 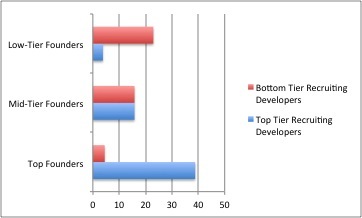 Developers show a lot of interest in working for them, placing them just outside the top ten. 3) Big and Important Problem for Society. I don’t think it’s a coincidence that personal finance, productivity, hiring, and education are at the top of the list, while games and entertainment are at the bottom. Developers want to build something useful and societally valuable. Industry correlates with “useful and societally valuable” but it’s not an perfect relationship. Many of the companies that are more successful attracting developers than the model would predict have a real chance to positively impact the world, while those that are less successful are often playing zero sum arbitrage games. 4) The Rest of the Hiring Process. We aren’t yet in a world where clicking on a button in AngelList commits a developer to a company: there are many additional stages. Initial intrigue is one thing, but as I learned at Circle of Moms, there’s a lot more to hiring than one “yes, I’m interested” click. Some companies may have a low “interested” rate, but a high rate of closing candidates; as a former (and likely future) hiring manager, I’d take that tradeoff. The best companies have great products, well-marketed, at an attractive price for consumers. The same applies to startups trying to appeal to developers. The product — the existing team and its culture, the business’ goals and prospects, and the opportunity for the individual — is central. But the marketing — in this case, a clear articulation of the company’s vision — is also crucial, and the right price (salary) helps as well.